All seven of our fall varsity teams are in the win column as we head into the second week of September. Field hockey, soccer and tennis all had perfect weeks and are starting to gear up for conference play. The volleyball team had its season-opening four-match win streak stopped by unbeaten Cary Christian on Wednesday, but is still 4–1 heading into this weekend’s tournament at North Raleigh Christian. 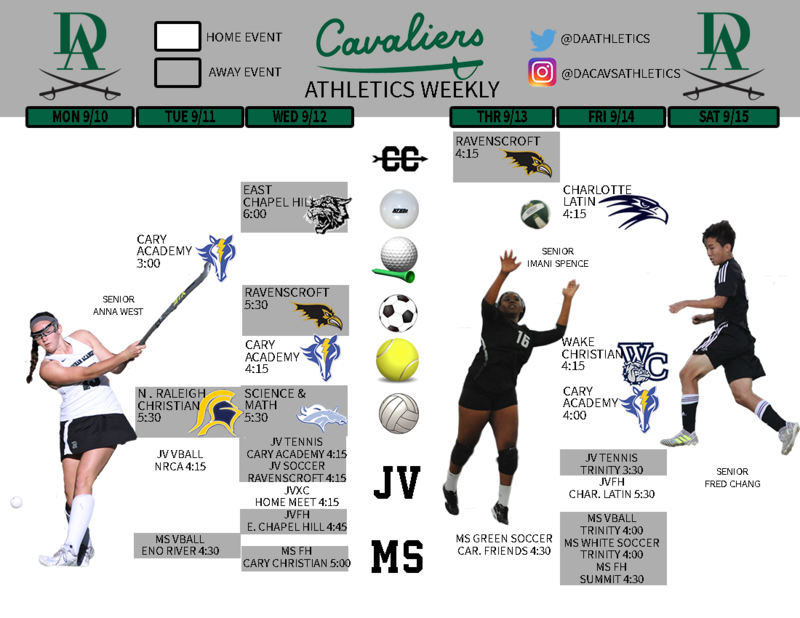 This week’s Cavs Corner includes our final season previews, featuring the cross-country and girls golf teams. Both the boys and girls cross-country teams are anticipating strong seasons this year under the leadership of coaches Costen Irons and Kristin Stroupe. The boys’ third-place state finish a year ago may be a little misleading, as their 16:36 average time in the state meet was the fastest time in school history. While the boys’ top-6 is still in flux due to a litany of pre-season injuries, Irons is anticipating a healthy team as the season progresses. Leading the way for the squad will be senior captains Jack Anderson and Neil Mosca. While Anderson competed in the Cavs’ opening meet (a 22–42 win over Cary Christian on Aug. 29) and finished third with a time of 19:28, Mosca is still recovering from a broken foot and is hoping to be in the lineup soon. Mosca’s return to the team will be a huge boost, as he was the seventh-place finisher in the 2017 state meet and third-ranked returning runner. Junior Mark Alkins, who won the opening meet last week with a time of 19:26, had what Irons called a “spectacular track season” in the spring and will be a highly ranked runner this year. The surprise of the summer was sophomore Jay Shanahan, who moved from last year’s No. 12 position on the team to an anticipated top-six runner. Jay’s hard work has paid off; in the alumni meet, he ran a PR by more than two minutes. Shanahan’s 19:27 was second in the Cary Christian meet. Irons says he expects juniors Bennett Dombcik and Mac Hays to round out the team’s top six when they return to the lineup after recovering from their injuries. Until that happens, the team will be relying on senior Spencer Adler, junior Shan Wang, sophomore Ryan Norris and senior Tigey Jewell-Alibhai (all top-nine finishers in last week’s opening meet) to fill the void. With 28 runners on the team, Irons and Stroupe are excited about the dedication, improvement and progress of all. “We are building a culture where everyone’s effort impacts each other,” Irons said. With so many runners out of service with injuries, this will be a complete team effort early in the season. The girls squad consists of 11 team members with just one senior on the team, captain Anneke Dekker. The team “has the potential to be one of the strongest girls teams in recent history,” Irons said. A pair of youngsters should be at the top of the Cavs’ lineup, as ninth-grader Stella Stringer (last season’s conference champion and third-place state finisher) and sophomore Anna Catherine Wilson (the opening-meet winner with a time of 21:10) return to the team eager to lead. Wilson’s time was a full minute faster than any race she ran last season. The Cavaliers girls defeated Cary Christian 17–41 in that opening meet, as DA took the top four spots and six of the top nine. Right behind Wilson and Stringer in the win over the Knights were juniors Fran Pacchiana and Claire Middleton. Middleton’s 22:47 was two minutes faster than any time she posted in 2017. Dekker improved 40 seconds from the alumni meet to the Cary Christian meet, and sophomore Quinn Shanahan’s ninth-place time in the Cary Christian meet of 25:46 is especially impressive since she has had to limit her early-season training due to injury. Irons says “her positive attitude and strength throughout the process inspires her coaches and teammates.” With just one senior on this youthful team, the present and future looks bright for the girls cross-country team. Both the boys and girls squads will be back in action as they host the Durham Academy Invitational on Saturday morning. After a year of rebuilding, coach Greg Murray and his girls golf team are ready to compete for a conference and state title this year as All-Conference senior Haley Leversedge and eighth-graders Ona Lukes and Kaley Kim return from last season’s third-place conference finish. Joining those top three will be senior Jinger Callwood, who Murray is excited about because of her improvement over the summer. Already, the Cavs have faced one of their biggest tests, losing 145–130 to Wesleyan Christian in the season-opener. The Trojans, with multiple college prospects, should be one of the teams to beat around the state. Murray says North Raleigh Christian and Ravenscroft will be the Cavs’ biggest competition in the TISAC. The Cavs improved to 1–1 on the season in yesterday’s 41-stroke win at Saint Mary’s. Led by a 40 from Lukes, the Cavs defeated the Saints with a final score of 131–175. The two eighth-graders on the golf team, Lukes and Kim, are both little sisters of former DA golf greats. Lukes’ three brothers have all made their mark at DA; Dylan is playing at Appalachian State University, Quade is setting records at Elon University and Ethan is the leader of the current DA squad. Kim’s older sister, Ashley, holds the school record for the girl’s team. The DA volleyball squad lost for the first time this season, as unbeaten Cary Christian came to Kirby Gym on Wednesday and defeated the Cavs 24–26, 25–17, 25–19, 25–15. The loss comes on the heels of a 25–19, 25–21, 18–25, 25–22 victory over Voyager Academy on Aug. 30. In the win over the Vikings, junior Millie Loehr led the team with 17 kills and seven blocks. Sophomore Elizabeth Kohn had 12 kills, two aces and a team-high 21 digs. Junior Adriana Kim added a team-best 36 aces and five kills. The Cavs will head to North Raleigh Christian this weekend for the Volley with the Knights tournament. Games will be played Friday evening and Saturday. The varsity boys soccer team won two matches over the past week, including last night’s 4–1 victory over previously unbeaten Cary Christian School. The Cavs, winners of three in a row, are listed as “others considered” in the latest High School OT soccer poll. The Knights were ranked No. 25 in the same poll, so the Cavaliers have a great opportunity to enter next week’s top 25. Senior Nick Epstein was the catalyst in Wednesday’s win, as he scored both first-half goals and assisted on a second-half score. Also finding the back of the net were sophomore Walker Benjamin and senior Beau Townsend. In the 2–1 win at Greensboro Day on Aug. 30, the Cavs held the Bengals scoreless for 79 minutes and used two scores by junior Tanner Barry in the win. Senior Jack Horgan and junior Ryan Kirschner had assists in both victories this week. Senior goalkeeper Roberto Escobar gave up one goal in 120 minutes of action. Next up for the soccer team will be Friday’s home match vs. Cary Academy and Wednesday’s showdown with top-ranked Ravenscroft in Raleigh. The girls tennis team keeps rolling, having won two matches this past week, both 9–0 shutouts. The 5–1 Cavaliers currently hold the top spot in the latest North Carolina High School Tennis Coaches Association poll and are fourth in the High School OT poll. DA defeated Greensboro Day on Wednesday 9–0 in a match that went close to four hours. The top four of senior Joy Callwood and juniors Madeline Towning, Alexis Galloway and Renee George dropped just five combined games in their victories. The match of the day was a battle of ninth-graders on court six. The Cavaliers’ Mukta Dharmapurikar won a tight 6–4, 4–6, 11–9 match after saving a match point late in the third set tiebreaker. In Friday’s 9–0 win at Saint Mary’s, the Cavs used 10 different players to win their conference opener. Towning, Galloway, George, Dharmapurikar and juniors Sarah Clark and Taylor Hunter all won straight-set singles matches. Next up for the girls will be Friday’s road match-up vs. a strong Ravenscroft team in Raleigh. The field hockey team has been off since the 2–0 win on Aug. 30 at Providence Day in Charlotte. The win was sparked by goals from senior Eleanor Robb and junior Elizabeth Owens. Senior Lizzie Kerman and sophomore Katherine Lantzy provided assists, while junior Victoria Lawton had nine saves for her second straight shutout. Another tough Charlotte school is next on the schedule, as Charlotte Country Day comes to Durham on Friday for a 4:15 p.m. showdown on Moylan Field.